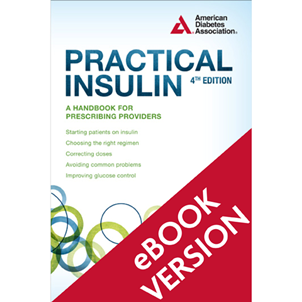 This indispensable handbook from the American Diabetes Association gives you the practical knowledge and data you need for initiating andmaintaining insulin therapy in patients with type 1 or type 2 diabetes. With this easy reference guide, you can take the concerns and fearout of insulin therapy and make improved glycemic control an attainablereality for your patients. Don’t let a patient’s worries aboutself-administered injections, hypoglycemia, and weight gain get in theway of better health outcomes.